ALBANY, NY — In the 27-year history of American Hockey League in the Capital Region, no team has ever started a season 4-0 … until now. 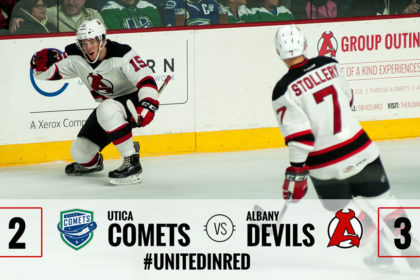 The Albany Devils set a new standard, reaching the milestone after a 3-2 victory against the Utica Comets Saturday at Times Union Center. 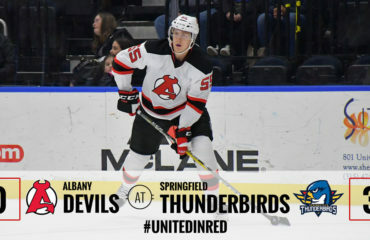 According to the Times Union’s Pete Dougherty, the Albany River Rats of 1993-94, 1996-97 and 1998-99 each started 3-0 before dropping their fourth game. Playing in his first professional game, Jan Mandat played the hero, netting the game-winning goal midway through the third period. 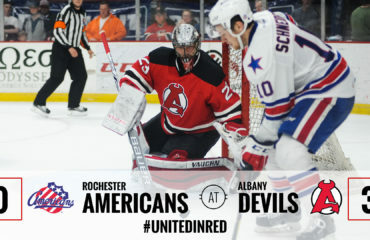 Albany had surrendered a 2-0 advantage before the Devils’ rookie sent a wrister past Utica’s Thatcher Demko at 9:37 of the third. 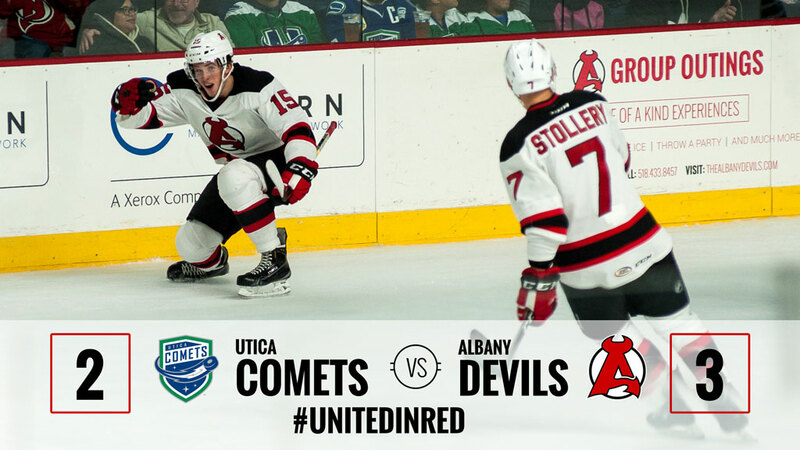 The Devils have won 13 of the 15 all-time meetings between the Comets, improving to 13-0-2-0. Reece Scarlett and John Quenneville both registered a power-play goal and an assist. Ryan Kujawinski helped set up the Mandat game winner. For the fourth consecutive game, the Devils carried a lead into the first intermission. Scarlett opened the scoring at 17:06 after Quenneville won a puck battle along the left half wall. Scarlett walked the puck along the blueline and sent a wrister into the upper-right corner for his first tally of the season. The Devils grabbed a 2-0 lead with their second power-play tally. After receiving a cross-ice pass from Joe Blandisi at the right face-off dot, Quenneville found the upper-right corner at 3:19 of the second. The goal was his third of the season and secured his first career multi-point game. Utica found a response with back-to-back goals in an eight minute span. Michael Chaput scored shorthanded at 14:27 of the second and Derek Hulak beat Wedgewood at 2:30 of the third. Scott Wedgewood, who helped bounce the Comets during the first round of the 2016 Calder Cup Playoffs, continued to stand strong, stopping 18 of 20 shots to improve to 3-0-0. The Devils’ netminder continues to close in on his 50th victory. Saturday’s win was the 48th of his career. 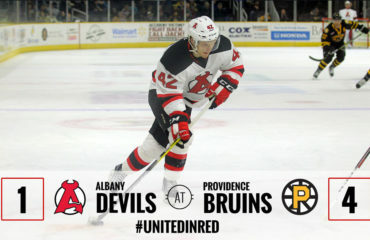 The Devils go for their third win in as many days as they travel to face the Providence Bruins Sunday at 3:05 pm.